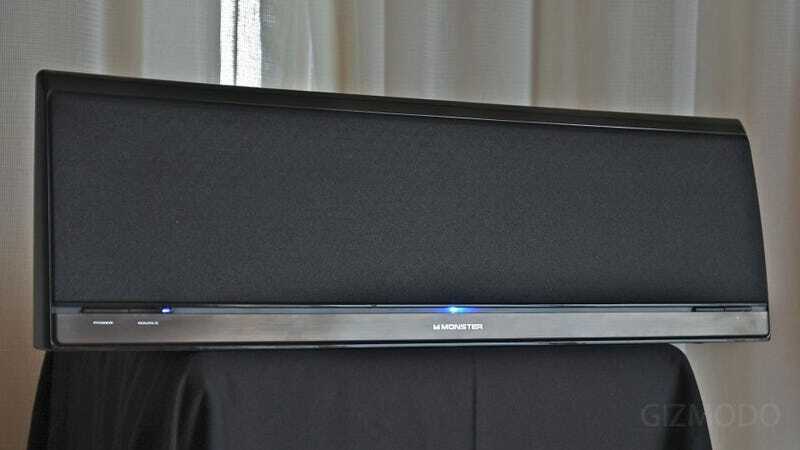 I just got a chance to listen to Monster's forthcoming Katana, a six-speaker, 400-watt (! ), Bluetooth system, and it's incredible. A Bluetooth audio system has never sounded better. Monster's new innovations in wireless technology might be the next big thing. The engineers at Monster have spent a lot of energy fine-tuning its Bluetooth audio processing so that it sounds good, and boy does it show. I listened to a few songs on the new Katana and heard everything that's been missing all along from Bluetooth: details, clarity, a full-range of tones, and deep, convincing bass. It was hard to believe. You see, until now, there haven't been too many Bluetooth speakers worth spending more than $100 on. They're a nice convenience for certain situations, but hardly what you'd want to rely on for your main speaker system if you care at all about sound quality. (Audessy's new Bluetooth computer speakers might be the lone exception). The Katana is completely different, and it's not all a secret sauce of ones and zeros. Even as Bluetooth audio encoding has gotten much better the speakers manufacturers use it with have remained relatively dinky. Monster's three-way speaker system is big enough that you need to bear hug it. Yes, that means it's not exactly portable, but it also means it can have larger bass drivers and that the dome tweeters are placed about two-feet apart from each other improving the clarity of the sound projection. In addition to Bluetooth, the speaker will accept 3.5mm input as well as USB audio from "virtually any source." Katana, like Monster's Clarity HD, has the company's proprietary wireless transmitter port, which will be compatible with it's new StreamCast HD system. The transmitter and receiver system, which will launch later this year, is Monster's answer to Sonos and AirPlay. (Monster says that AirPlay adoption has been weak, and it's not especially interested in the technology.) It'll allow you to beam very high-resolution audio over radio from a computer to any system with the transmitter installed. And that's just the basic use case for StreamCast. It'll have a lot of configuration options for multiple zones and simultaneous streams depending on how you want to use it.